First of all let me say that I am sorry for me taking so long for my first (non theme round) post of the Challenge. 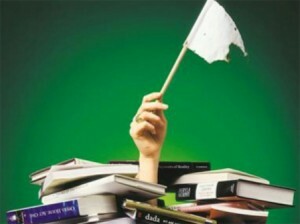 When Curt asked if I wanted to take part this year, I already knew that I would be hard pressed between the day job, learning for university and this. Never did I know how hard. 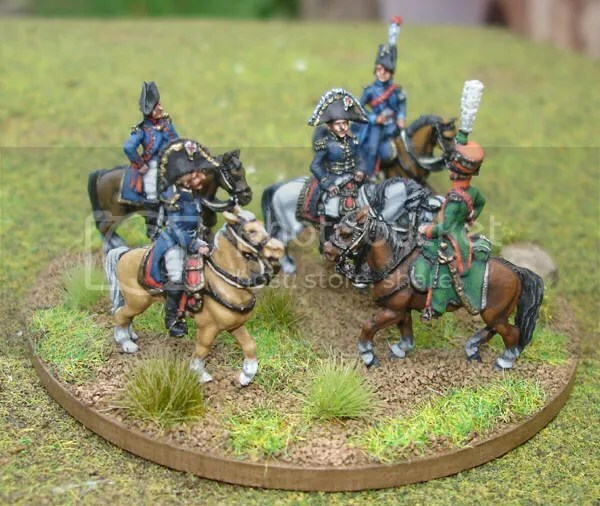 While I was able to get some minis painted, (spray) varnishing them was another matter, with the weather here in Germany being either very cold or very humid. 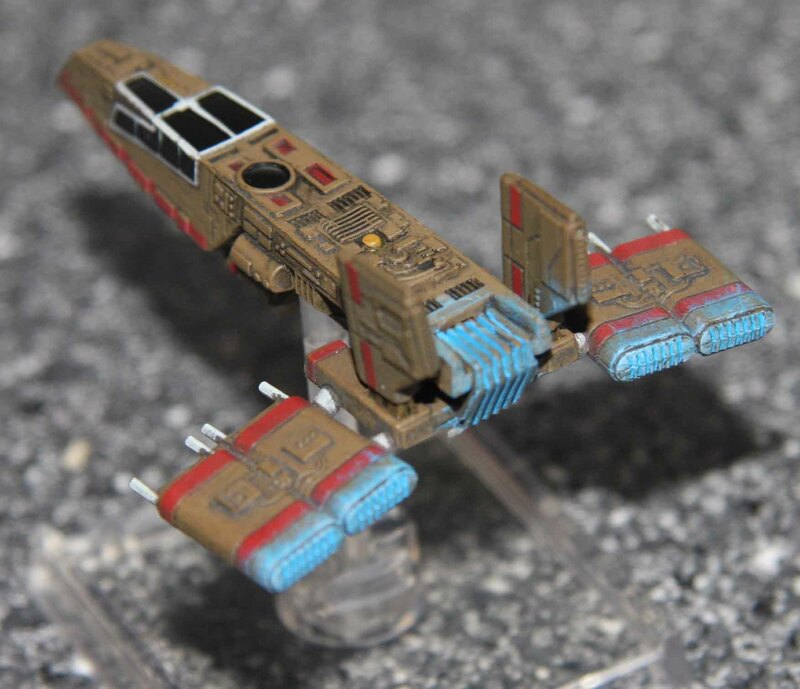 But I finally managed to get some varnish on these minis last week and thus do the bases so here is the first of a couple of entries, a few Star Wars X-Wing re-paints. 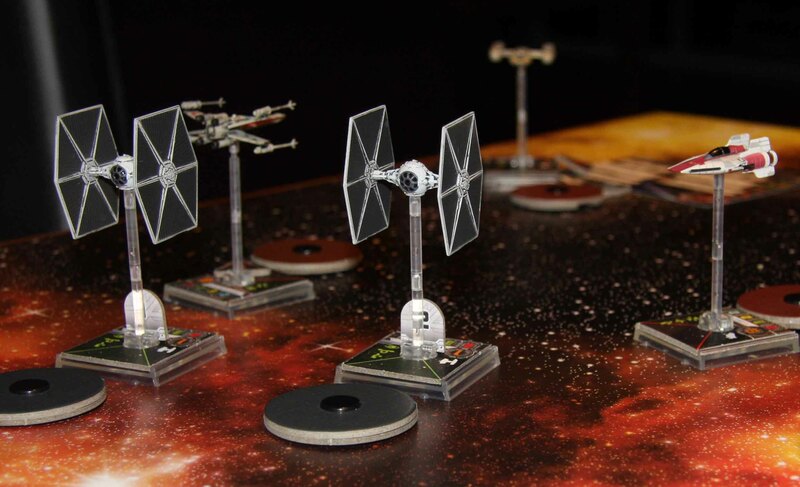 To be honest, I have not played a single game of X-Wing in recent year and while I did play a couple of space combat games lately, we have rather taken a fancy to Armada. 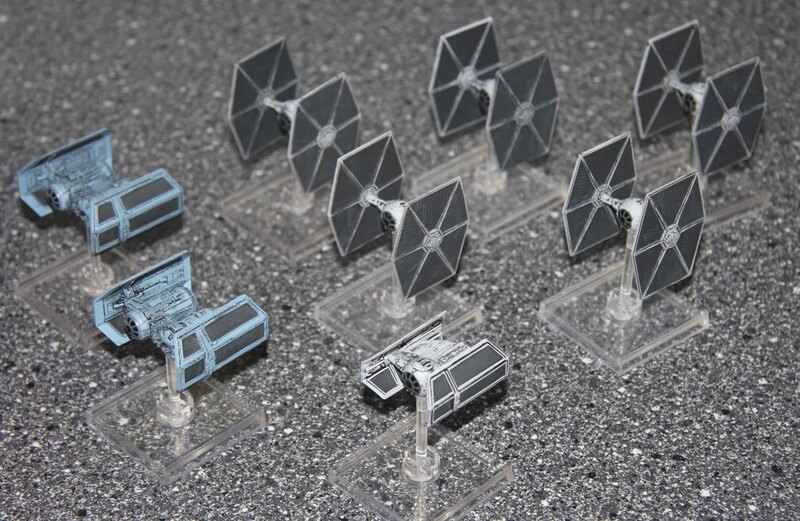 But since I had already repainted (to rather added to the paint job) of my other X-wing minis, I felt the remaining few should get that treatment as well. That left me with a couple of A-Wings and the Millennium Falcon. With the former I decided to change their colour from red to green. I never liked the fact the all Rebel fighters in the game had the same colour coding, so the only ones that still sport their red are the X-Wings. I the case I simply painted the red markings over and added some engine glow to them. The other one is the Millennium Falcon. Now in this case I guess I got a pretty sloppy pre-painted model. Many of the panels that were painted in a darker grey or ochre were painted over the panels themselves and the black wash had been applied rather heavy. So I found a grey that matched the base tone and corrected those overpainted panels. I also dry brushed the whole model in this grey to lessen the looks of the black wash. Afterwards I set more panels apart in ochre and grey to give the Falcon a more motley look and added an engine glow. And that was it. 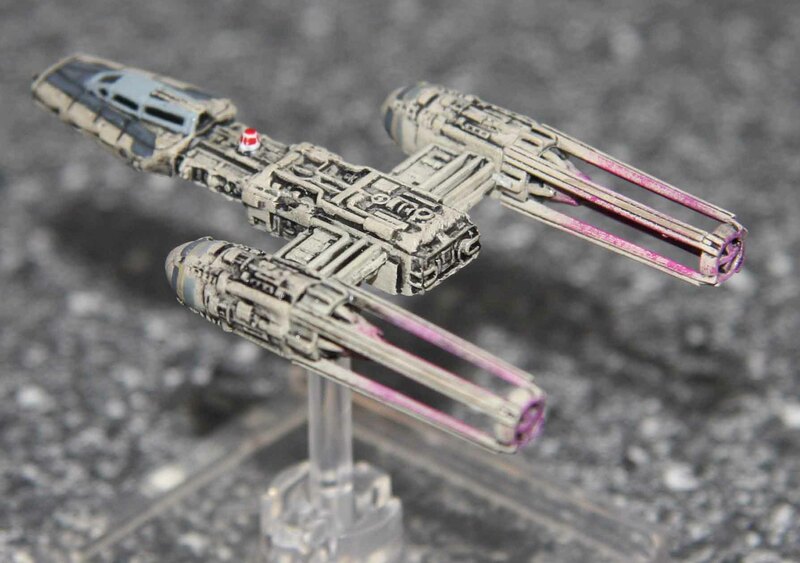 Hot on the heels of our first X-Wing game, I decided to repaint my craft. Nothing special… just a little paint here and there. First up are the X-Wings. Just added red engine glow and painted the Astrodroids. To add a little variety, one is red, one green and one blue (if I should play Luke Skywalker, this will be his craft and the Astrodroid R2D2). I briefly contemplated matching the red markings to those found in the movie, but I did not have a color to match their base coat and was in no mood to do a complete repaint. 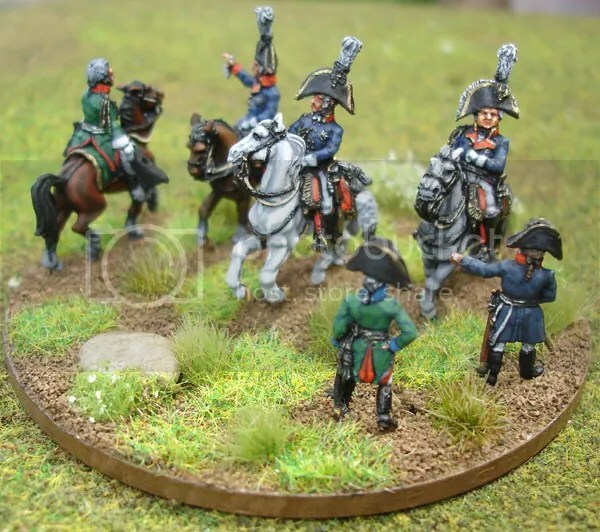 After all I wanted a game where I did not have to paint the minis from scratch! Up next is my lone Y-Wing (in due time he will get a wingman, just as the X-Wings will be upgraded to four as well). As with the X-Wings I added engine glow and painted the Astrodroid red. I never liked the looks of the Gold Squadron craft, so I painted the markings over in blueish dark grey to make him a member of Grey Squadron. And my two B-Wings. Again added engine glow (the great thing with these is that the plexiglass stand enters the craft in the middle of the exhausts which allowed me to enhance the effect). No Astrodroids on these, so none were painted. 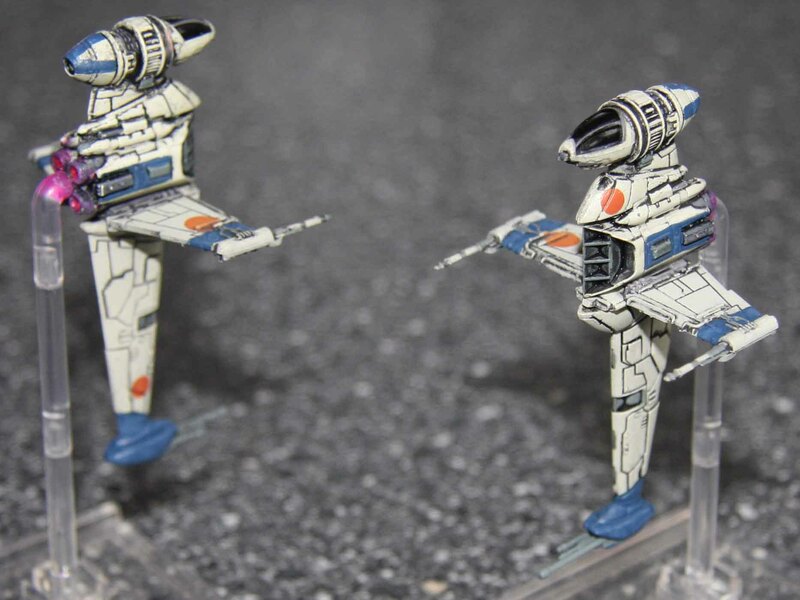 With these I felt their squadron markings were too sublime, so they became members of Blue Squadron. And the last bigger repaint of them all is the HWK-290. Just added the engine glow here. Since this was not part of the movies but just the computer games, there was footage showing the engines and I went for a blue instead of the red of all the Rebel fighters. Now I also did some repainting on my Ties, but this was very sublime. I just touched up some of the parts where they had not been properly painted (real problem only on the Tie Fighters) and highlighted the wing panels a bit. I wanted to add engine glow, but looking at the movies, I had to find that they have no engine glow. I am still contemplating if I should give them blue engine glow like the HWK-290 anyway. What do you think? 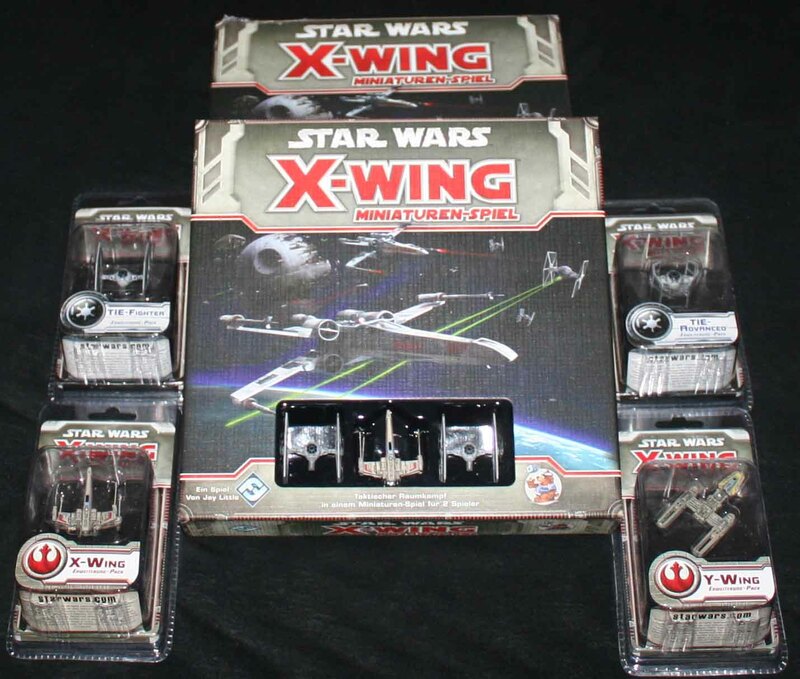 Some of you might remember, that my better half was kind enough to gift me with the X-Wing game (twice) and some extra fighters for my birthday last year. 368 days later it was finally time to have a game and I met up with Martin and his son Max. 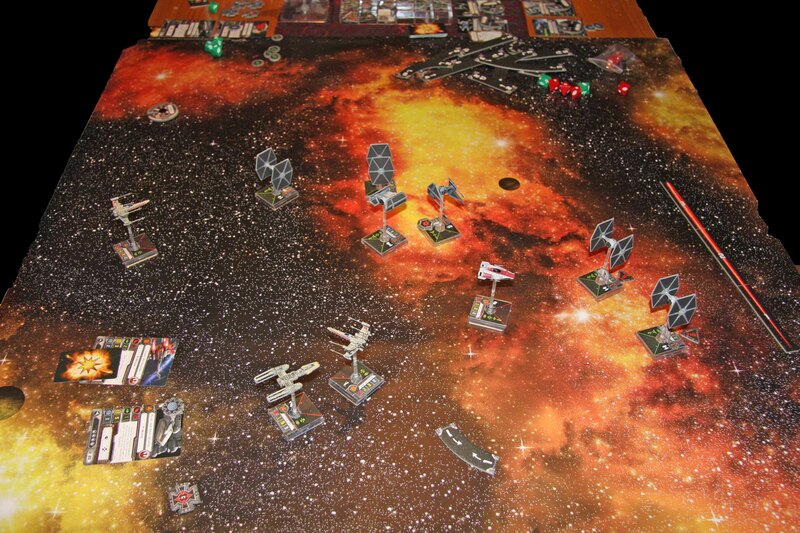 We decided to play 100 points each side, with Martin and Max playing Rebels and me playing the Empire. We went for just the craft, without any bells and whistles like astro-droids, torpedoes and so on. The Rebels had Luke Skywalker, a Y-Wing with a unique pilot as well X-Wing and an A-Wing with a non unique mid quality pilots. 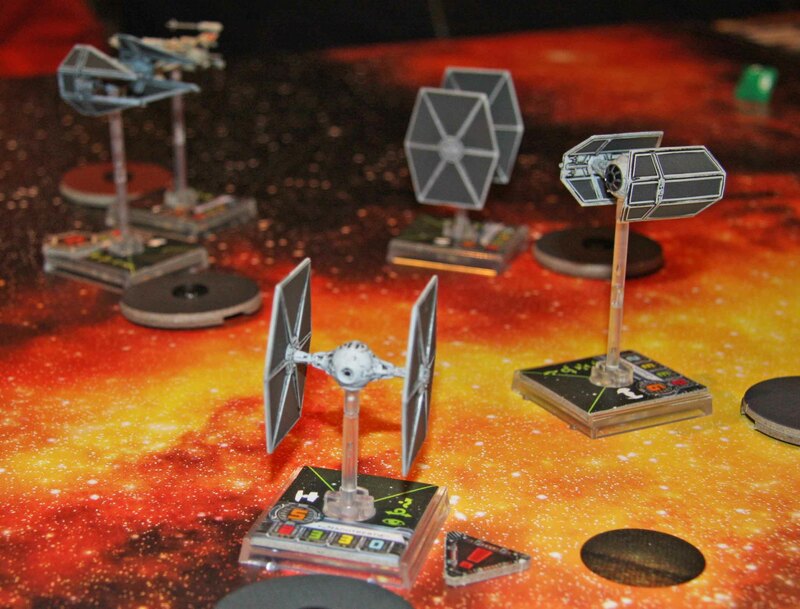 I had Darth Vader (simply because I wanted one pilot with a real high ability rating and felt that my only craft with shields would be a good choice), a Tie Interceptor with a basic pilot and four Tie Fighters (Backstabber, Black Squadron Pilot and two basic pilots). 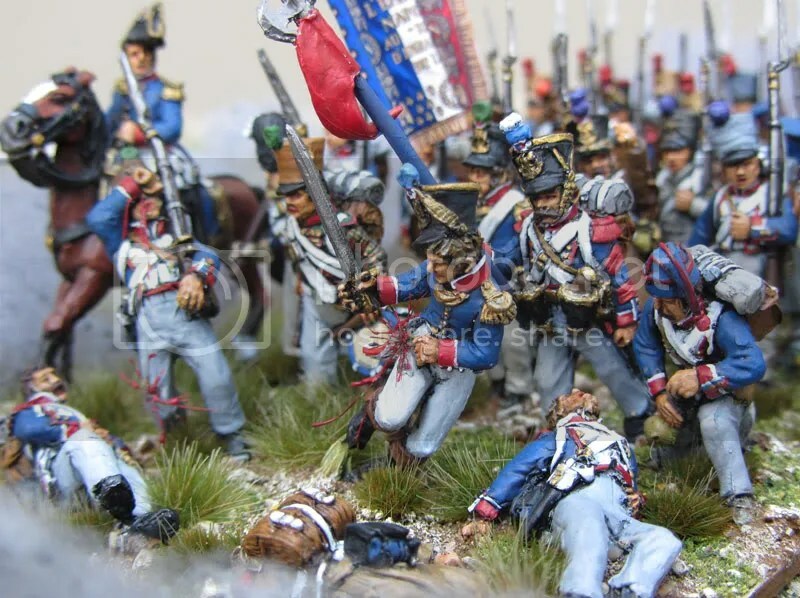 Now this turned into a real proper dogfight, which took quiet a while, so I am not going to bother you with a detailed report, but just show some pictures and give the highlights. Now what hurt me the most was my Interceptor receiving a critical hit on the first round, which prevented my from doing any complicated maneuvers for the rest of the game. Which was quiet a shame since this meant that I could not always bring the craft with the most firepower into the best firing position. What really surprised me were the Tie Fighters. I assumed that they would die pretty fast with their low structure points and lack of shields. But their ability to do barrel rolls is great once the fighting gets close. 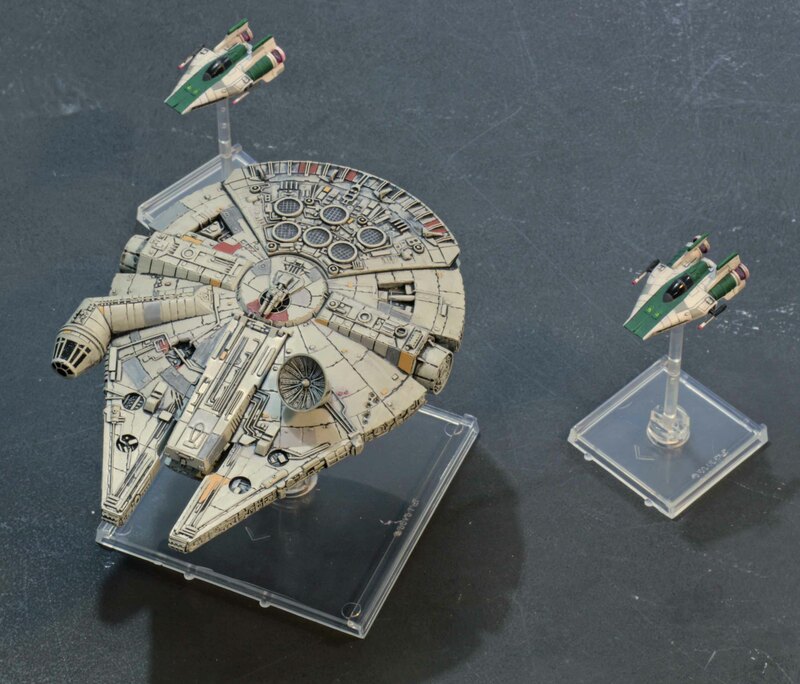 More than once (I would guess over a dozen times) I was able to barrel roll them or one of the other models out of the Rebels arc of fire while they were still able to shoot. In the end I felt this was better than shields. But this was also the deciding factor why the game took so long. The Rebels could rarely shoot and I had to work my way trough their shields. So after about eight rounds we decided that the game would not end when one side had been wiped out, but rather when Skywalker or Vader were shot down. 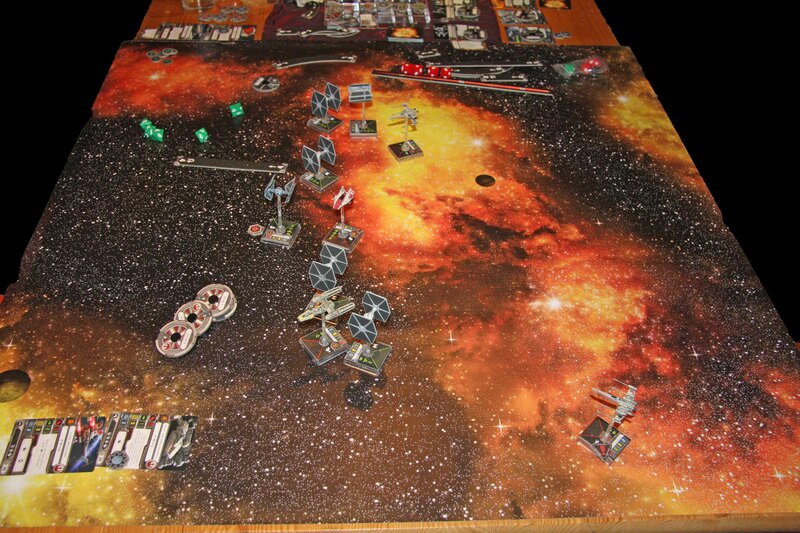 In the end I lost one of the Tie Fighters with a basic pilot while the other one was down to one structure point. The Interceptor still only had this one critical hit and the other craft were in mint condition. On this final round I shot down Skywalker and the A-Wing while the other two had no shields left and the X-Wing had a critical hit. I know this all sounds like it was a boring game, but actually it was just the opposite. Very tense and entertaining. So I am sure we will have another game soon. And since I am now sure I will play more, I will go and add some details to the craft I have.